The committee is also planning to initiate the expulsion of a deputy head of the Opposition Bloc, Serhiy Lyovochkin. 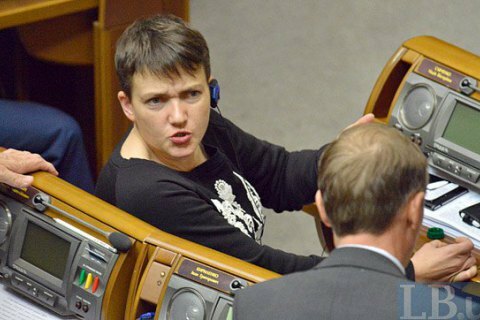 The parliamentary committee on national security and defence on Wednesday, 18 January, recommended the legislature to exclude Nadiya Savchenko from the committee. The motion was supported by eight out of twelve committee members. During the discussion, MP Andriy Teteruk, who was the rapporteur, stated that the activities of Savchenko harm the interests of the state and are "outside the scope of the legislation". He recalled that the MP has voluntarily negotiated with terrorist chiefs and published lists of prisoners without the permission of the SBU. The committee condemned Savchenko's actions and found them in violation of the law on protection of state secrets. The committee is also going to initiate the expulsion of a deputy head of the Opposition Bloc faction, Serhiy Lyovochkin, according to Interfax-Ukraine. Committee head MP Serhiy Pashynskyy said a motion to this effect would be registered tomorrow. On 7 December, Savchenko secretly visited Minsk to meet "D/LPR" leaders Zakharchenko and Plotnytskyy. The media suggested that the Russian Federal Security Service (FSB) is trying to carry out an exchange of prisoners so that it would look as if Ukraine (represented by Savchenko) directly negotiated with the "legitimate authorities in Donbas" represented by the terrorists. On 10 January, Savchenko published a list of prisoners despite the position of the SBU.